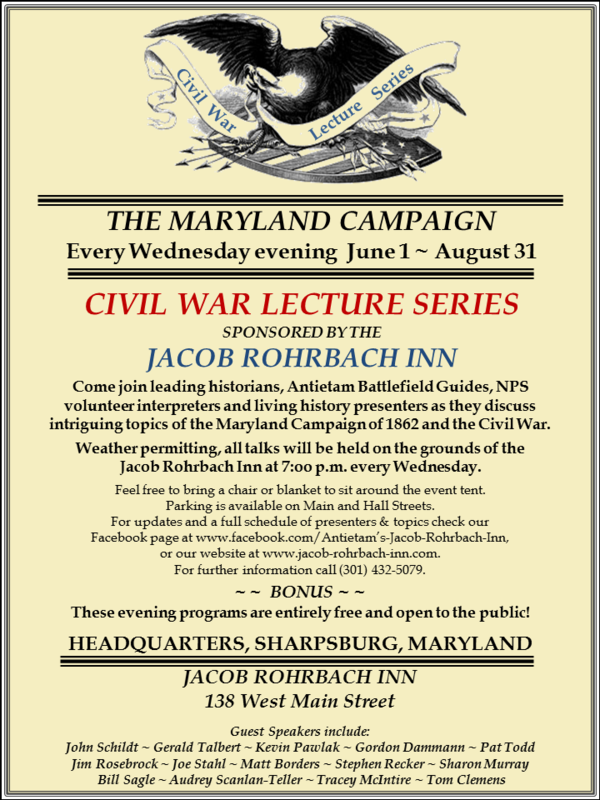 Come join leading historians, Antietam Battlefield Guides, National Park Service volunteer interpreters and living history presenters as they discuss intriguing topics of the Maryland Campaign of 1862 and the Civil War. 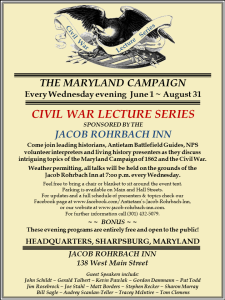 Weather permitting, all talks will be held on the grounds of the Jacob Rohrbach Inn at 7:oo p.m. every Wednesday starting on June 1st through August 31st. These evening programs are entirely free and open to the public. Feel free to bring a chair or blanket to sit around the event tent. Parking is available on Main and Hall Streets. For updates and a full schedule of presenters & topics check our Facebook page or our website. Yes, by the end of March a full list of the speakers and their topics will be available on our website, our Facebook page and numerous local tourism event calendars. We’re glad to help point guests to the Rural Heritage Museum during their stay with us.